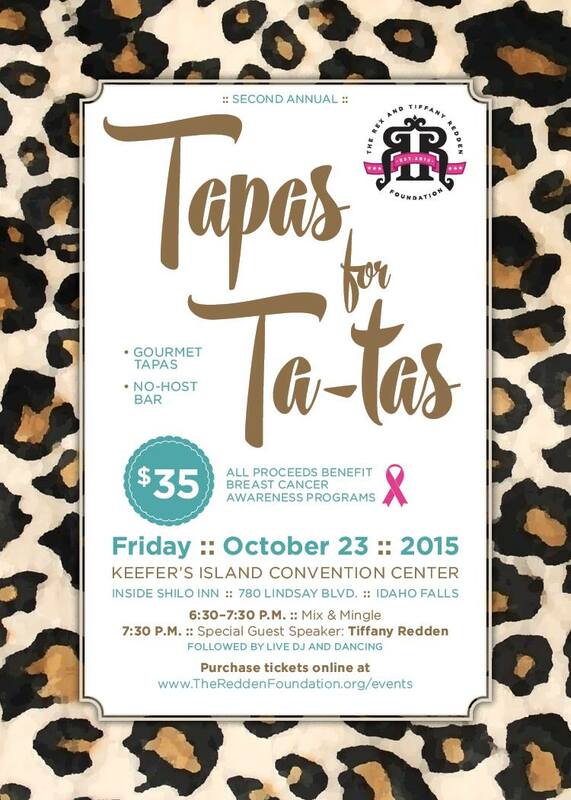 In recognition of Breast Cancer Awareness Month, the Rex & Tiffany Redden Foundation is hosting its second Tapas for Tatas dinner Oct. 23 at the Keefer’s Island Convention Center in Idaho Falls. Last year’s event raised more than $10,000 to aid breast cancer research and to help raise awareness through education and screenings. Survivors of all forms of cancer are invited to attend and be honored in the survivor presentation. In addition to the presentation, there will be a raffle drawing, music and a raffle, music, a Survivor Presentation, and a talk from Tiffany Redden, who was diagnosed with triple negative breast cancer in November 2013. This aggressive form of cancer had advanced to stage 3 and metastasized to her lymph nodes. Pre-registration is required at http://www.thereddenfoundation.org/survivors. Photos and names of survivors to be honored at the event can be emailed to tiffanyredden@ymail.com.